Golfing under the midnight sun. “Oops”, Geir Johnsen says whilst watching his golf ball fly into the seaweed. “You really have to be careful with your swings out here”, he says, shaking his head. The northern hobby golfer is right. We’re at Bodø Golfpark, way out on the beach with the massive Lofotenveggen mountains on the horizon. As Johnsen is closing in on the third hole, you can even see the scraps of an old fishery on the shore nearby. Make one mistake out here, and the golf ball can easily end up in a creek or in a nearby forest – or perhaps hit an unknowing duck in the head. “But that’s the price to pay when you play around in untouched Nordic nature”, Johnsen says. It’s one hour past midnight and we’re playing golf. As Johnsen once more tries his best to put in the third hole, the floodlight of the midnight sun is casting long shadows over the course, filling it with a warm light that is almost at its brightest. Suddenly, the green is no longer just green. It transforms into a landscape that looks like a fairy tale. In light of the magical atmosphere, it seems to be no coincidence that there are hidden old burial mounds on this northern course, right next to hole number four. “So if you feel a sudden gust of wind, it can be the ghost of an old Norwegian Viking king”, Hansen jokes. In the northern hemisphere during the summer months, the earth’s tilt towards the sun is responsible for the midnight sun. Conversely, the winter is long and dark, though lit by a special light show of its own: the northern lights. There aren’t many golfers out then. But north of the Arctic Circle in summer, some golf courses are open 24 hours a day, exploiting the precious light for all it’s worth. Surrounded by the characteristic northern nature – the long coastline dotted with fishing villages in the shadow of craggy peaks – it makes for an extraordinary experience. The midnight sun is a natural phenomenon that occurs during summer in places south of the Antarctic Circle and north of the Arctic Circle – including Northern Norway. The earth is rotating at a tilted axis relative to the sun, and during the summer months, the North Pole is angled towards our star. That’s why, for several weeks, the sun never sets above the Arctic Circle. Svalbard is the place in Norway where the midnight sun occurs for the longest period. Here, the sun doesn’t set between 20 April and 22 August. Midnight sun golfing, Bodø Golfpark. Midnight sun golfing, Lofoten Links. You’ll find Bodø Golfpark by the shore on the mainland. 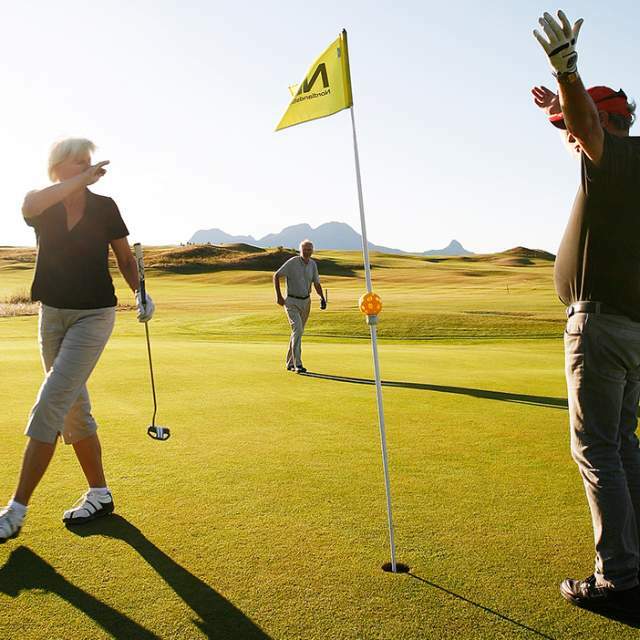 Lofoten Links is placed on sand dunes and faces directly towards the open ocean, whilst in Narvik, you golf below the steep mountains by the Ofotfjord. In Tromsø, too, the course has a direct view of the water. The northern greens are alive at night in more than one sense. Most of the courses are surrounded by teeming animal life. You may just have to put alongside an elk or an otter or try to ace while the gulls are howling out at sea. “By the west side of hole five and six at Bodø golf course, there’s the occasional reindeer running by”, says Johnsen. Besides, it’s not only on the green you can spot an “Eagle”. 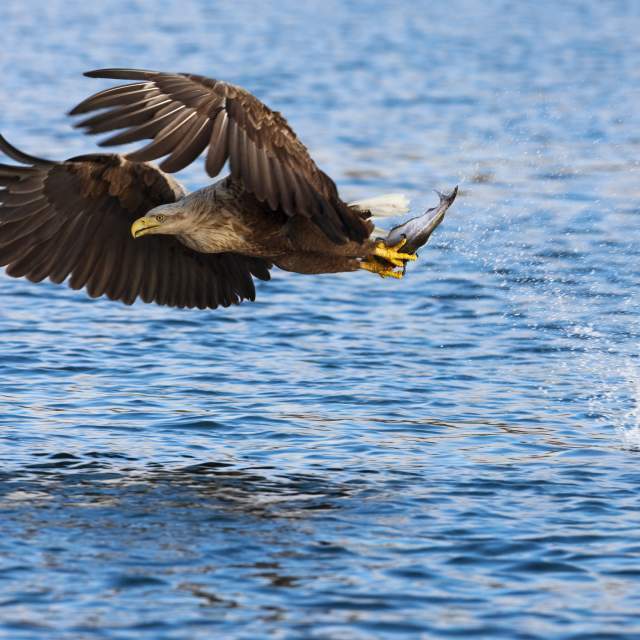 Look up at the sky, and you might see a white-tailed sea eagle cruising through the wisps of cloud. When the northern winter is as long as it is, it’s quite clear why people grab the days of eternal sun with both hands. Stay awake, and you may just make 18 more holes before breakfast. Welcome to Harstad golf course! Norway may not have the best courses in the world by traditional standards, but playing at a white beach under the midnight sun is something you won’t forget that easily.